I was in Victoria when Neal Armstrong landed on the moon. That has nothing to do with this post, but it’s the number one thing I associate with the capital of British Columbia. On a recent visit this summer, I fell in love with a bookstore in Victoria—Munro’s Books. Its tagline is “Canada’s most magnificent bookstore.” It’s true, too. 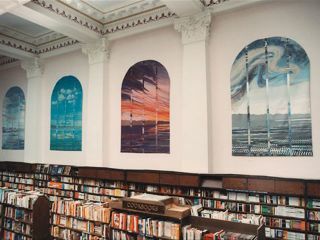 Munro’s is the most beautiful bookstore I’ve ever visited–and it was founded by Jim Munro, the husband of Nobel Prize winning author, Alice Munro. Talk about a powerful literary heritage! Located in a heritage building on a main street in the city centre, Munro’s is easy to find. In fact, chances are excellent you’ll stumble upon it without even trying. It’s just a few blocks north of the famous Empress Hotel. One of her most popular series begins with the Wizard of Earthsea, which is, as the word wizard implies, fantasy. Her most famous science fiction book is The Left Hand of Darkness, about a world on which human beings have no set gender. My personal favorite of her SF books is The Dispossessed. It tells the story of the inventor of the ansible, a device for communication across interstellar distances. Many writers have borrowed the name and concept of the ansible, including Orson Scott Card, Elizabeth Moon–and me, in The Guardian Angel of Farflung Station. And finally, back to Powers, the third book in her Annals of the Western Shore, following Gifts and Voices. It won the Nebula Award in 2009, and I bought the book out of guilt. I take my Nebula voting privileges seriously; I read all the finalists before voting; but I blush to say I skipped Powers because it was long and time was short. I missed out on a great read. Munro’s stocks many authors beyond LeGuin, of course. Another book that tempted me was Victoria Bench by Bench, a tour guide for mobility-challenged tourists, and my back was bothering me horribly at the time. It’s better now–thanks for asking. All in all, Munro’s is a beautiful palace of a store that harkens back to an era when bookstores were bookstores … whenever that was. It’s the perfect place to buy a book by a Nobel Prize winner, too. Next time you’re in Victoria, pop on by Munro’s Books–and tell them I sent you. What about you? Do you have a favorite bookstore? Tell us about it in the comment section. And be sure to check out other Bookstores I Love. Very cool – Ed. Will share. 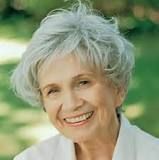 One of the best things about writing this blogpost was that it reminded me to read more Alice Munro. I’ve read perhaps a third of her books, and when she won the Nobel Prize I intended to read the rest; I truly did. But I didn’t.